Line the bottom of a 9-inch springform pan with a round of parchment paper. To make the crust, combine the Oreo crumbs, melted butter and sugar in a small bowl. Mix together with a fork until all the crumbs are moistened. Press the mixture onto the bottom of the prepared pan. Preheat the oven to 325 degrees F. To make the filling, beat together the cream cheese and sugar in the bowl of a stand mixer at medium-low speed for 1 minute. Add eggs, unsweetened cocoa powder, sour cream, buttermilk, vanilla extract, vinegar and food coloring. Mix on low speed just until fully combined. Pour the batter into the prepared pan. Bake at 325 degrees F for 10 minutes, reduce the heat to 300 degrees F, and bake for 1 hour and 15 minutes or until the center is firm. Turn off the oven, prop the door open slightly, and let the cheesecake stand 30 minutes. 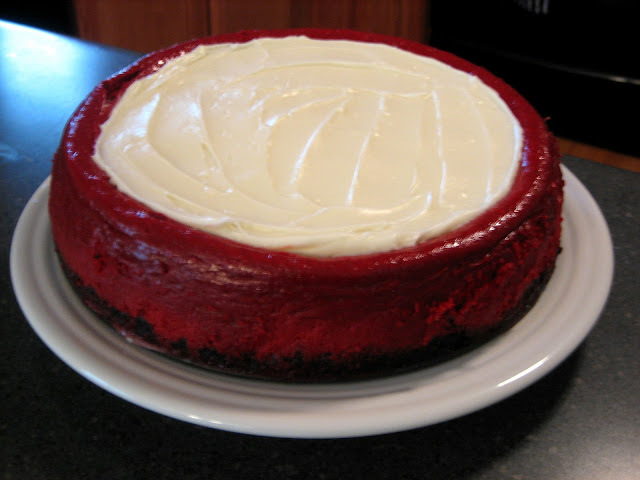 Remove the cheesecake from the oven; cool in the pan on a wire rack for 30 minutes. Run a thin knife around the outside edge of the cake to separate from the pan. Cover and chill for at least 8 hours. When I made this, I foolishly decided to run to Starbucks while it was baking. Bad decision #1 I went to the slowest Starbucks in town. Bad decision #2 it was exam week so Starbucks was extra-crowded with students and I stood in line for forever. Thankfully I got home with 7 minutes to spare on the timer. To stay on the safe side, just stay home during the change the temperature, prop the oven door open portion of this recipe. This is very delicious, but rich, so cut small pieces! I can testify to how delicious it is! Thanks, Sherri!